Today is my dear sister's (cousin) birthday and she lives all the way across the country on the West Coast. So since there was no way I was going to meet her today, I wanted to surprise her with some home-baked Chocolate Chip Cookies. I baked some few days ago, wrapped them up and shipped them to her. She got the package yesterday(a day early) and loved the cookies..boy was I glad, all the efforts were well worth it. 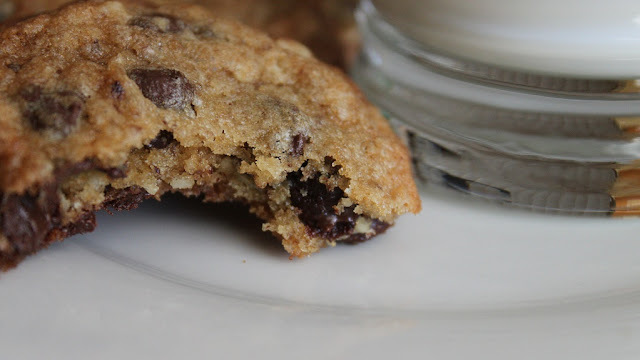 I chose Dorie Greenspan's Chocolate Chip Cookie from the book "Baking From my Home to Yours". 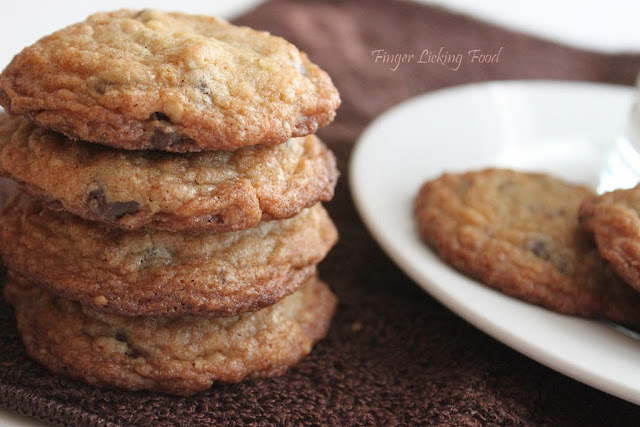 I knew this recipe wouldn't fail in anyway and would yield gorgeous and delicious tasting cookies. I was tempted to add my own twists to the recipe along the way but decided to let the original reign for once! The only change I made was use semi-sweet chocolate chips instead of bittersweet. Centre a rack in the oven and preheat to 375 F. Line two baking sheets with parchment or silicone mats. Whisk together the flour, salt and baking soda. Cream the butter on medium speed,using a hand held electric mixer or a stand up mixer fitted with a paddle attachment, for about a minute until smooth.Beat in the vanilla. Add the eggs one at a time beating well after each addition. Reduce mixer speed to low and add the dry ingredients in 3 portions, mixing only until incorporated. Mix in the chocolate and walnuts sing a rubber spatula. Using a 1/4 cup ice-cream scoop, place leveled mounds of dough on prepared baking sheets. Bake for 10 minutes until the edges are brown. Turn sheets half way through baking time. Bake only one sheet at a time and cool sheets between batches if using only two baking sheets. Remove baked cookies from sheet using a flat metal spatula and cool completely on wire racks. Store in air tight containers for up to a week. I prefer to eat these while they are still warm and the chocolate is still gooey inside. 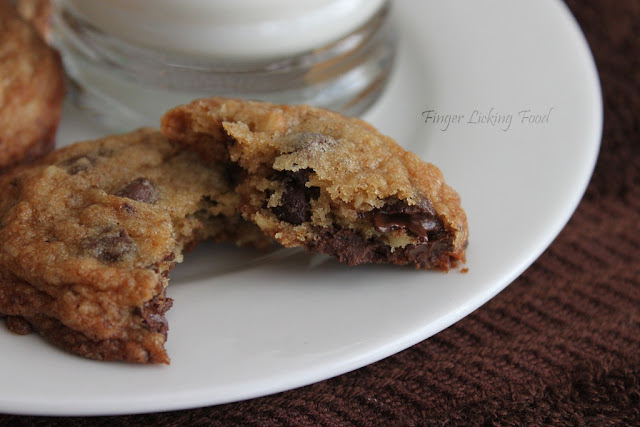 The cookie texture is perfect, slightly crisp on the outside and soft on the inside. Delicious with a glass of cold milk. Slurppp! 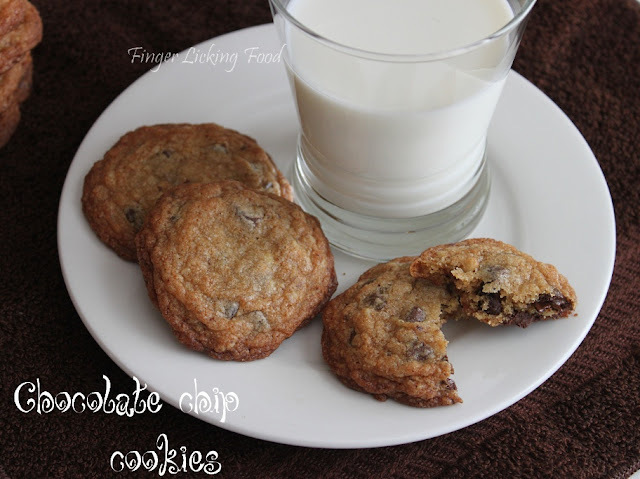 !feel like grabbing few cookies from the click..lovely clicks.. I love her book too and have baked lot from the book. 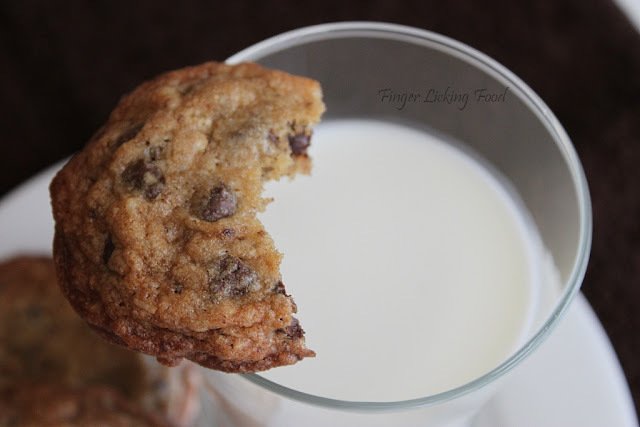 These cookie slook so so good. Very nice clicks!!! Looks yummy.